SILCHAR, August 13: The martyrdom of Bir Tikendrajit Singh and his significant role in the Anglo-Manipur War of Independence was observed jointly by Manipuri Xahitya Parishad,Manipuri Diaspora, All Assam Manipuri Students' Union, All Assam Manipuri Women's Meira Paibi Coordination Committee and United Manipuri Association in the premises of Jarma Singha M E School, Bahadurgram, Cachar with a day-long programme. Recalling the sacrifices of Bir Tikendrajit, speakers said that the great patriot and martyr was hanged till death in the Pologround of Imphal for revolting against the British Government. It was on this day that Tikendrajit was sent to the gallows and the eventful occasion is observed with all honour and dignity across the world. The sacrifices and martyrdom of Bir Tikendrajit continue to inspire and ennoble the youths and instill in them the sense of patriotism and the spirit of being bold and courageous to stand against all sorts of oppression and suppression. 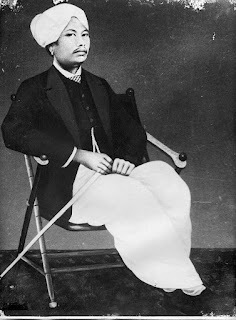 Bir Tikendrajit was the fourth son of Maharaja Chandrakirti. He was braveand chilvarous to lay down his life for the causeof the country and people.He was also the chief of the Manipur army. The speakers recollecting the glorious chapters of the war against the Britishcolonial rule to free Manipur from their clutches said the unparalleled strength of mind and body of Tikendrajit and his daredevil spirit to meet the challenge of the colonists would always bepart of the struggle of oppressed people against their oppressors. It was in 1891 that the British Government declared war against Manipur. Manipur was invaded and Bir Tikendrajit was arrested from Kangla Fort. He was tortured and then orderedby the British to be hanged. Quite sad, he was hanged in front of the general people on the polo ground on this day. He was not only a heroic figure for Manipur but also for the entire nation. He also played active role in the freedom struggle of India.